NOW Sold Secure Gold approved. “ Untouchable” 19mm high spec security chain. Actual link diameter- 19.85mm equal to almost 20mm. 1.5m length mid link chain. Case hardened process for maximum strength and security. 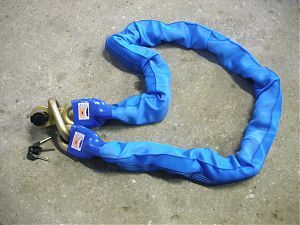 Chain weight- 11.85Kg – recommended for “ home use “ due to weight. This chain cannot be bolt cropped by hand- 19mm chain will NOT fit into the jaws of the largest bolt croppers. Note: NOW Orange protective sleeve. Blue/Red/yellow/Black plastic end cuffs prevents fraying of sleeve. Ideal usues include; High value motorcycles, off road motorcycles which are very often not insurable, heavy plant, machinery etc. UNTOUCHABLE LOCK- SOLDE SECURE GOLD APPROVED. Compact 21mm double locking shackle. Tested to six ton pull. Also Classe SRA and FFMC recommended- French approved.